One of the insights of people of faith is that God is active in history as he seeks to bring creation into conformity with his purpose. There have been those in every age who have discovered something of God's purpose and have attempted to pass it on. Sometimes, God's activity has been reported in supernatural terms, but fully as often, the activity of God is revealed in the faithful actions of human beings. For that reason, the Old and New Testaments are filled with the experiences of individuals who have discovered God's presence in their individual circumstances. 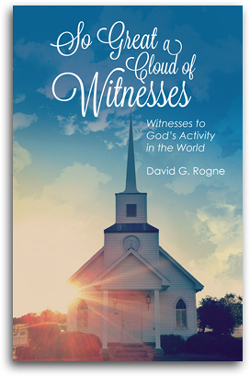 David Rogne's So Great A Cloud of Witnesses will give readers an appreciation for the people of faith who are presented, and humbly recognize the cost borne by so many to deliver the faith to us. They are a great cloud of witnesses. They have played their part in relaying the faith to subsequent generations, and they are now filling the stands in the heavenly arena, eager to see how we continue the race. Witnesses have been chosen from varied backgrounds so that it may be seen that people from all walks of life are called to live faithfully and to witness to God's truth. The entire known story of some of these individuals, such as Joseph, the husband of Mary, may be just a few verses of Scripture. Some, such as the Wiseman and the Emmaus disciple, are not even named. Nevertheless, their witness is important. Rogne attempts to give life to the testimony of these less-well-known witnesses by giving them names and employing a little imagination. In every case, the subjects tell their stories as they might have experienced them. David G. Rogne served as senior minister at a number of United Methodist congregations in southern California for 39 years. A graduate of the University of California at Berkeley, Rogne received his M.Div. degree from Fuller Theological Seminary and his D.Min. degree from the Claremont School of Theology, where his doctoral project involved first-person preaching. Rogne currently writes, lectures, and preaches on special occasions and is a resident of South Carolina. He is also the author of All About the Kingdom, Telling It Like It Was, Let Me Tell You… (CSS), and also a collaborator on Sermons on the Gospel Readings, Series I, Cycle B.